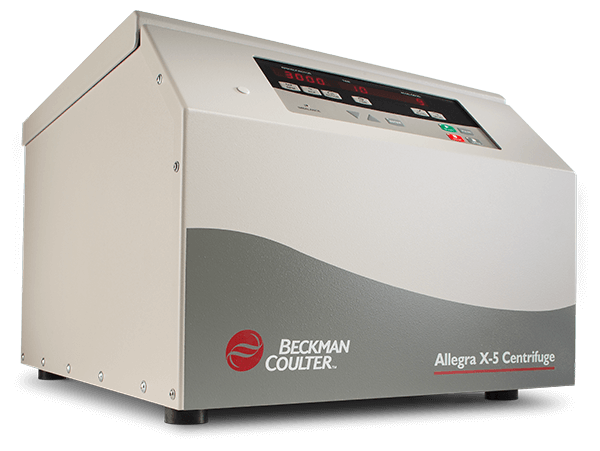 This air-cooled benchtop centrifuge was designed specifically for the clinical laboratory. The Allegra X-5 performs with endurance under the most exacting standards, offering enhanced productivity and reliability for almost any clinical sample preparation. Convenient, pre-bundled packages—including swinging bucket rotors and common adapters—get you up and running quickly. Or you can choose from a selection of optional adapters. The Allegra X-5 is ideal for serum, plasma and whole blood sample processing; protein precipitate, particulate and cell sedimentation; in-vitro cytotoxicity and receptor binding sample processing.